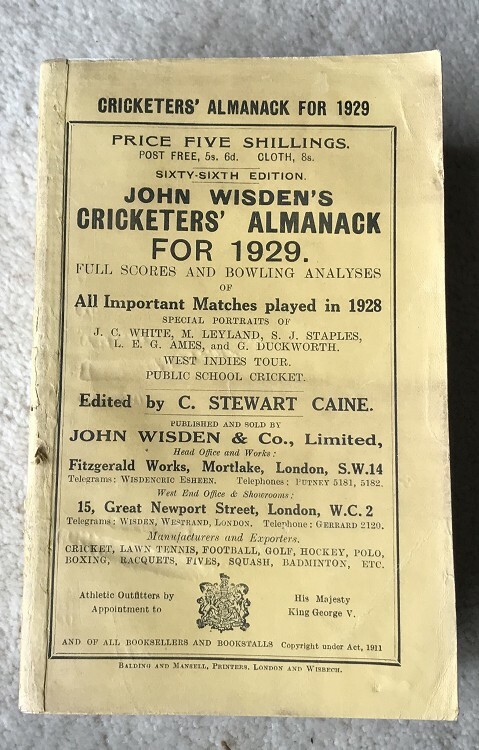 This lot is an Original 1929 Wisden Paperback. Book Description: 66th Edition, in original paperback. This lot is in very good condition, nice yellow covers with minimal markings, tightly bound and internally excellent including the photoplate. The spine paper is complete and tightly bound, possibly had a touch up but hard to tell as rarely seen on a 1929 paperback, due to the size of it. Circle mark to spine, internally not much to report on the defect side, light usage over its life. Straight spine. Tiny bend to one of the cover corners. Please see the large pictures. Hard to find year in paperback.